A groups of Korean anarchists in 1920s China are determined to overthrow the military and government. A gangster in Busan is caught having an affair with his boss's mistress. The two decide to run off with the organizations money, leading to dire circumstances. An orphaned boy falls in love with and writes anonymous letters a to 30-year old woman because she reminds him of his mother. fighting with all the means they can get their hands on against the Japanese colonialists. Its very interesting to see a movie about this particular theme, and it was fairly well executed also. 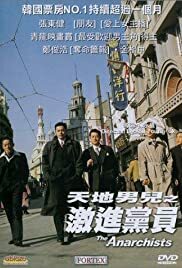 Not so much a movie about anarchists, this is about a particular group in Shanghai that went to quite drastic means in order to fight off against the Japanese. A strong point of this movies is that it doesn't judge their actions and makes the characters one-dimensional. Instead we get a feel about what they're fighting for and understand the conflicts amongst themselves. Anarchism is a gentle wind blowing from a wonderful place only to meet the harsh realities it is said in the movie. Here we see this collapse of the dream. It has a good script and has nice style, what I think takes away from the experience is overacting and silly editing in the action sequences. Apart from that it's fine.